J. Krishnamurti – Why Do We Act The Way We Do? A woman asks Rupert to talk about consciousness not having any polarity in itself. A man would like to know if there is room for love and compassion within consciousness. From “The Way of Liberation” Online Course, Adyashanti describes how his teachings are meant to be received. Instead of his teachings being answers in response to questions, they are meant to engage your heart, evoke your highest values, and continue to live within you at the core of your being. Examines beliefs around memory, time, space and perception. Clear pointing to our transparent reality. A man asks Rupert how he would talk to one of his loved ones if they were dying. It’s easy to blame our past for the mistakes we make in the present, but that’s no way to live a satisfying life. With over two-dozen published books translated in nearly as many languages, Ken Wilber has created what is widely considered the first truly comprehensive Integral Map of human experience. By exploring and integrating the major insights and conclusions of nearly every human knowledge domain in existence, Wilber created the revolutionary AQAL Integral Framework. In short, the Integral Approach is the coherent organization, coordination, and harmonization of all of the relevant practices, methodologies, and experiences available to human beings. Wilber states: “You can’t [realistically] honor various methods and fields, without showing how they fit together. That is how to make a genuine world philosophy.” He is the founder of the nonprofit think tank Integral Institute, co-founder of the transformational learning community Integral Life, co-founder of Source Integral exploring the nature of Integral Society, and the current chancellor of Ubiquity University. Do animals and plants have consciousness? Are electrons alive? Thich Nhat Hanh in dialogue with University of Virginia Astrophysicist Dr. Trinh Xuan Thuan. In a talk that drew enthusuisatic applause from her audience at the 2017 SAND Italy gathering, Jude Currivan, cosmologist and communicator extraordinary, adds a new perspective to the usual dichotomy of duality and nonduality, uniting them as differentiations of unity. She tells us of the amazing fine-tuning of the universal constants that have enabled organic life, and reports some recent research – including the astonishing fact that 50% of the water in our bodies is older than the solar system. Finally she talks of the history of the universe as a journey from simplicity to complexity, of consciousness expressing itself, and suggests that we are witnessing a time when this complex system must either break down or break through. We have a choice to fall apart in fear or leap into love together. She is the author of Radical Awakening (originally released as How to Find God in Everything) and Change Your Life, Change Your World: Ten Spiritual Lessons for a New Way of Being and Living. Both books were written shortly after her awakening and before she began to speak in public. Is There a Place for Ethics and Morality in the Non Dual Understanding? Rupert discusses why there is a need for ethics and morality if everything is consciousness or love. and who am I, really? Along with careers in Aerospace Engineering and car designing, John studied the sciences, mythologies, religions, philosophies, and psychologies, to expand his understandings. A pattern of paranormal experiences opened his mind to areas of experience beyond the paradigms of Science. In 1970, he embarked on a quest of Self Discovery, participating in hundreds of hours of intensive consciousness exploration with such noted researchers as Dr.s Jean Houston and Robert Masters, Dr. Lawrence LeShan, Robert Monroe, and others involved in the “human potentials” movements of the 1970’s. After a series of traumatic events in his life, John experienced a “metanoia”, what some call a transformation or “awakening”. John’s quest ended, and in the years since, he has been enjoying Life, knowing peace of mind, “unconditional love” of self and world, and freedom from fear and anxiety. John has been working on a verbal description of his experiences that does not rely on traditional metaphysical or religious ideas, but is consistent with modern scientific concepts of space, time, matter, and energy. Included essays offer his unconventional concepts of physics, time, thinking, consciousness, and human evolution. He believes that a dramatic experience of “awakening”, which is rare and very difficult to achieve, is not necessary for enlightened living; that with proper guidance and consistent effort, most people can achieve that state of being. While pursuing a life-long quest to understand the “big questions” of Life; John had careers in aerospace engineering and car designing. 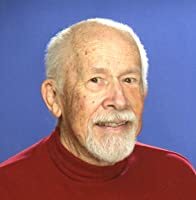 In 1970, he embarked on programs of self discovery, participating in hundreds of hours of intensive consciousness exploration with such noted researchers as Dr.s Jean Houston and Robert Masters, Lawrence LeShan, Robert Monroe, and others. 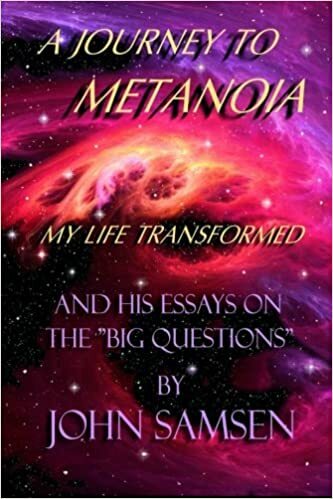 After a series of traumatic and tragic events in his life, John experienced a “metanoia”, what some call a spiritual transformation or “awakening”. John’s quest ended, and in the years since, he has been enjoying life, knowing peace of mind, “unconditional love” of self and world, and freedom from fear and anxiety. He has presented programs and workshops in self-discovery. John Samsen, now in his eighties, resides with his wife Tucky in the Sun City Hilton Head community. John and Tucky, are active in spiritual evolution groups, and, following a forty-year career in mental health nursing and education, Tucky is currently on the board of the SC Coastal Empire Mental Health Center. John also paints and teaches art classes locally.